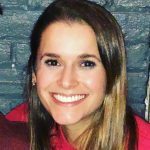 Love Mac and Cheese but watching your waistline? 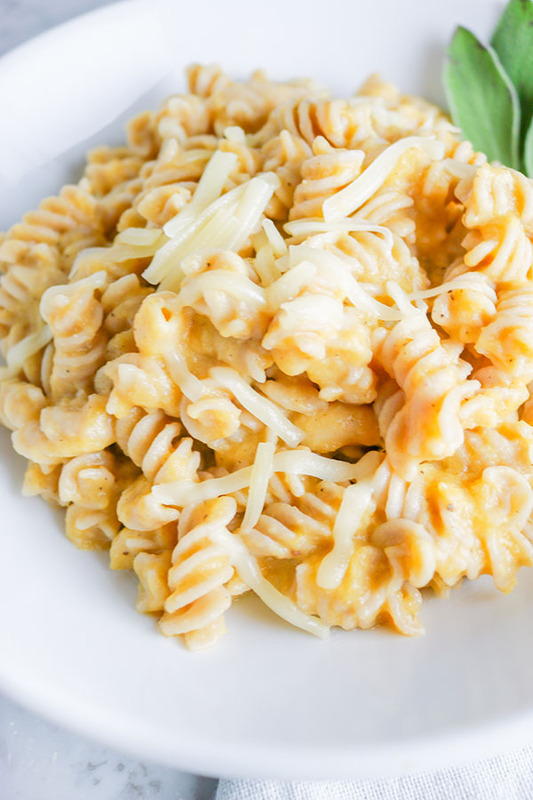 You’re going to LOVE this Healthy Butternut Squash Mac and Cheese. Satisfyingly creamy, yet light and flavorful! 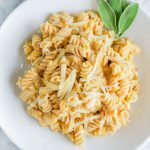 A few weeks back, I posted a Vegan Butternut Squash Mac and Cheese recipe – if you haven’t tried it yet, YOU SHOULD! If you are a little worried about completely giving up your love affair with cheese, have no fear. 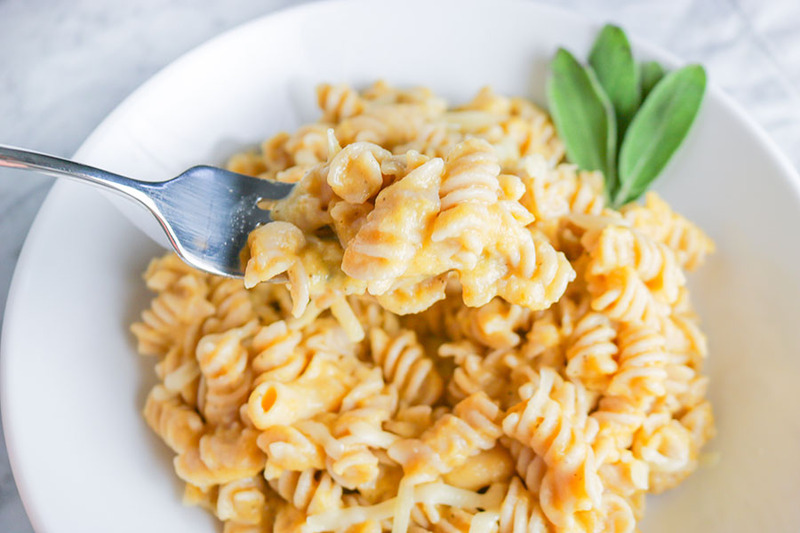 This Healthy Butternut Squash Mac and Cheese Recipe was adapted from an original recipe by Pinch of Yum, so you know it has to be 100% delish. 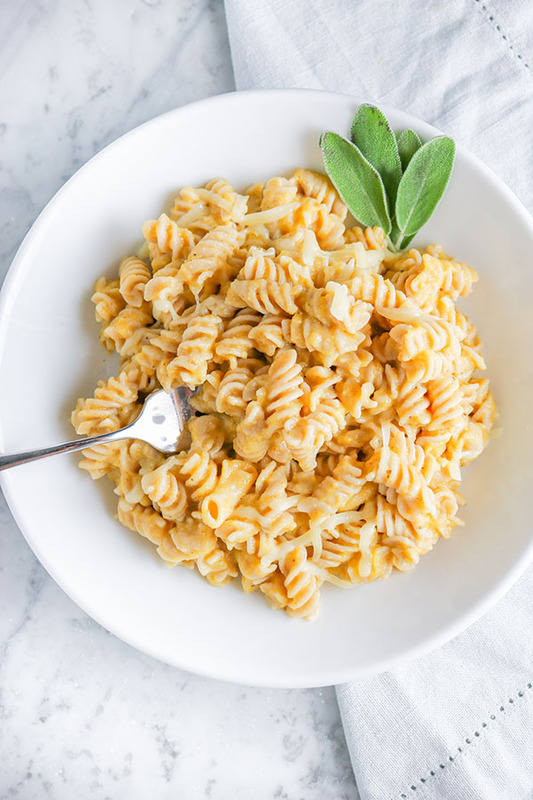 Just like in my vegan recipe, this Healthy Mac and Cheese uses caramelized onions to pack incredible flavor within the sauce. 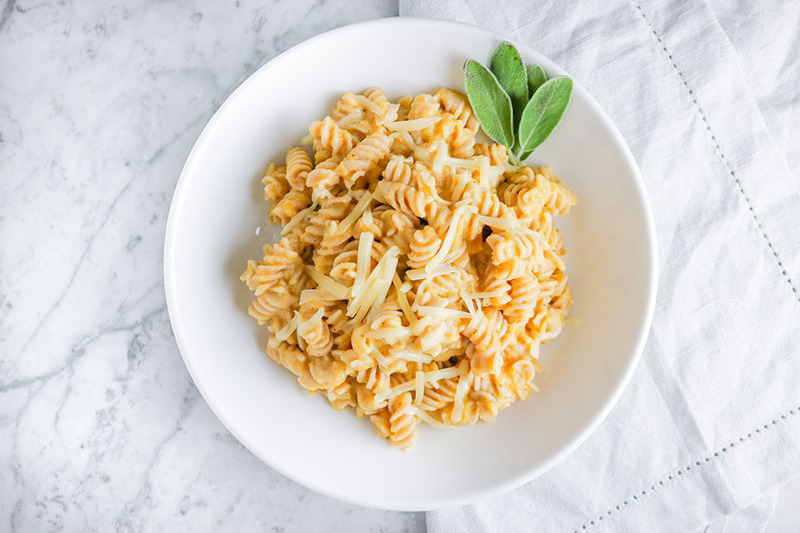 Gruyere cheese provides the perfect amount of flavor and cheesy texture to make you feel like you are enjoying the real thing! I used a whole wheat rice rotini in the pictures shown which I thought tasted great. Of course you can use this sauce with any noodle or noodle alternative! Traditional pasta, whole wheat, chickpea, rice, spaghetti squash, cauliflower gnocchi, zucchini noodles, carrot noodles, sweet potato noodles – heck you can go all out butternut squash and enjoy this sauce atop a bed of butternut squash noodles. This sauce is seriously delicious though – I’m pretty sure it would taste good on anything! Potatoes, rice, chicken – you can’t lose. You may notice in these photos I used a few leaves of sage to accent my plating – I thought this looked very pretty for the purposes of my photos… BUT, I would not recommend eating this pasta with raw sage unless you really love sage. I had some sage that I had used in another recipe and though – why not?! Raw sage though, not my thing. The flavor is far too overwhelming for a subtle pasta like this. So what are you waiting for?? 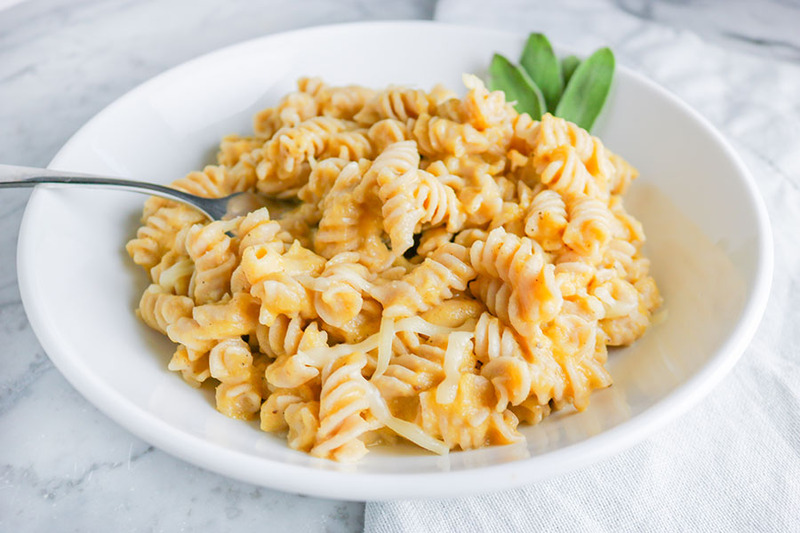 This Healthy Butternut Squash Mac and Cheese is a MUST TRY! Get to it friends! 1 lb pasta any type! Cook pasta according to package directions - meanwhile, begin to prepare sauce. In a large pot, heat butter over medium low heat. Add onions to pan then saute (stirring occasionally) until onions begin to caramelize (about 15 minutes). Remove onions from pan and set aside. Once onions have been removed from pot, bring broth to a boil - add squash. Cook until tender (about 5-7 minutes). Remove 1/2 cups of broth from pot, then drain. Transfer squash to food processor (or blender). Add onions, broth, milk, half of cheese, salt and pepper to food processor. Process until sauce is smooth and creamy. Place cooked noodles in a large bowl - cover with sauce then toss with remaining cheese to combine. Serve as-is or place in a greased 8x8 inch and bake at 350F for about 15 minutes (or until hot). Garnish with fresh parsley, sage or additional cheese. Storage: For longest lasting leftovers, refrigerate sauce and pasta separately in airtight containers. Sauce will stay 3-4 days, pasta 1-2 days.